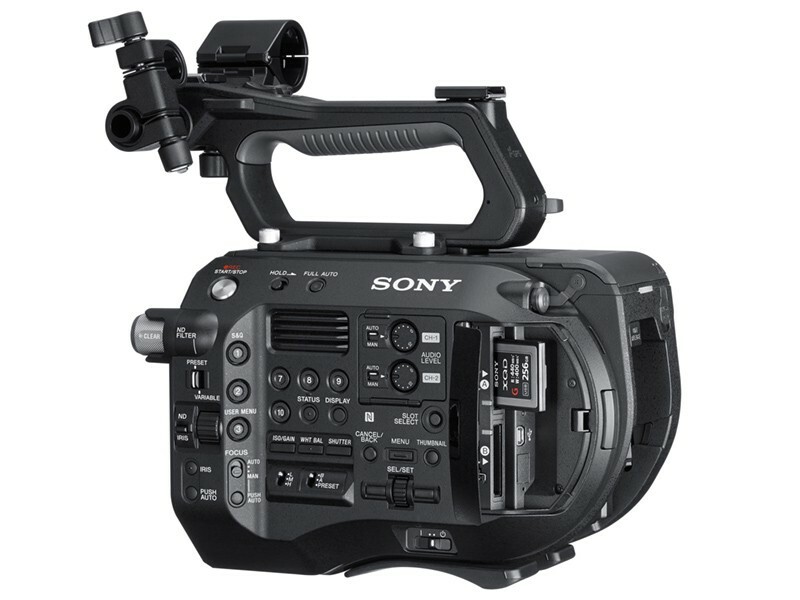 Designed as a camera that is at home on productions as diverse as "Cinéma Vérité"-style documentaries, reality TV, commercial and corporate applications Sony's PXW-FS7 XDCAM Super 35 Camera System is a flexible 4K camera system. It features a Super 35mm size sensor that allows you to capture images with cinematic depth of field. The camera's E-mount is machined from stainless steel and allows you to use E-mount lenses or with the use of optional adapters to accept most 35mm lenses including PL, EF, Leica, and Nikon. The camera can capture footage to optional on board XQD media cards in either UHD at up to 60 FPS or HD at up to 180 FPS. the camera can capture 4K (4096 x 2160) images and send the signal out over its SDI or HDMI connectors. The camera records in your choice of XAVC-I, XAVC-L, or MPEG-2. However, MPEG-2 recording does not support the high data rates the camera is capable of generating when shooting in UHD, and is limited to recording HD video only. The camera incorporates Dual XQD media card slots that support simultaneous or relay recording. An ergonomically designed handgrip provides control of many of the camera's functions and features an adjustable length support arm. The 4K Super35 EXMOR sensor with features 14 Stops of latitude and a wide color gamut. It offers a choice of XAVC or MPEG-2 codecs. The XAVC codec can be used for 4K and HD recording, while MPEG-2 ios limited to HD recording. XAVC comes in two flavors, XAVC INTRA, and XAVC Long, allowing you to encode from HD to UHD using Intra-Frame or Long GoP compression with 10-bit 422 for HD and the choice of 10-bit 422 or 8-bit 420 for UHD. XAVC intra compression is very efficient, recording at modest bit rates and XAVC Long also substantially extends the recording time while attaining very high quality and low noise. The PXW-FS7 is equipped with an E-Mount machined from solid Stainless Steel for stability and strength. It accepts optional E-Mount lenses from Sony, Zeiss and other manufacturers. The shallow flange distance allows you to mount most 35mm lens types such as PL, DSLR and legacy SLR lenses including Canon EF, Leica, and Nikon as well as many others with mechanical adapters. The camera body is made from magnesium, which is lighter and stronger than aluminum. This allows the camera body to weigh only four pounds. It's incorporates a shoulder pad and is designed to sit on the operator's shoulder or by extending the support arm of the SmartGrip to be held in front of the operator without requiring a support rig. The camera includes an ergonomic handgrip that Sony calls a SmartGrip, which features Zoom, Start/Stop and Assign controls. The SmartGrip facilitates camera operation with the right hand, leaving the left hand free to operate the lens. Both the arm and handgrip can be positioned at different angles permitting great flexibility. FS7 records internally in 4K up to 60fps in UHD 3840x2160 and in HD up to 180fps using XAVC-I or up to 120fps with XAVC-L. Recording Apple ProRes to the internal XQD slots requires an optional EXCA-FS7 extension box and future upgrade. 4K (4096 x 2160) is available over the 3G-SDI outputs or the HDMI 2.0 output of the camera so you can capture the 4096 x 2160 video using an optional external recorder. The camera features two XQD media slots that support simultaneous or relay recording. The camera also has an SD card slot that is only used for saving configuration data, and cannot be used to record video. Supporting enhanced data read and write speed, the 128GB XQD G Series Memory Card from Sony can be used to record a variety of content up to and including 4K video. In addition to recording 4K content, the 440 MB/s read and 400 MB/s write speeds make it easy to capture photos in both burst mode and in RAW format, as well as streamline workflows. This XQD G Series Card from Sony also supports both PCI Express Gen. 2 and USB 3.0 interfaces, allowing it to be used with a wide range of devices. Camera rentals INCLUDE 3 batteries. Choose this item if you need additional batteries. The Sony BP-U60 is a lithium-ion battery designed for professional video shooting in both the field and the studio. This battery is equipped with the INFO function that communicates battery status data to the PMW-EX1, PMW-EX3 camcorders. optional accessories or extra equipment that may be shown.